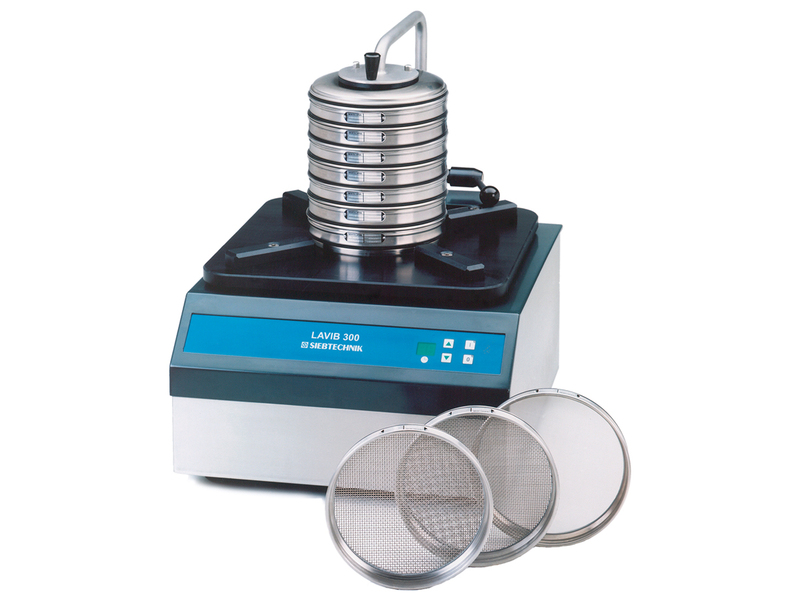 The LAVIB 300 is a screening machine that produces horizontal circular vibrations, suitable for analytical sieves up to 300 mm diameter. Gyratory screening machines are mainly used for the classification of fibrous, platelet type particles in the processing of wood, tobacco and plastics as well as in breweries and milling plants. The material to be screened is gently transported over the sieves in a circular motion. This type of machine can only be used for dry screening. Gyratory screening machines are mainly used for the classification of fibrous, platelet type particles in the processing of wood, tobacco and plastics as well as in breweries and milling plants. Depending on the area of use, the machine offers the possibility of either fixing the sieve stack or allowing it to move on the vibrating table. The latter leads to the centrifugal forces pushing the test sieve stack against buffers and thereby introduce additional horizontal impact, which shortens the screen time and reduces pegged material. The eccenter drive for the vibrating table and the compensation weight are fitted in a practical housing, the weight ensures smooth running and stability of this maintenance free machine. The keyboard is foil protected and controls the “On/Off” function and the time switch.